PROLERSKATING: A May Day Rollerskating Party! The Portland I.W.W. 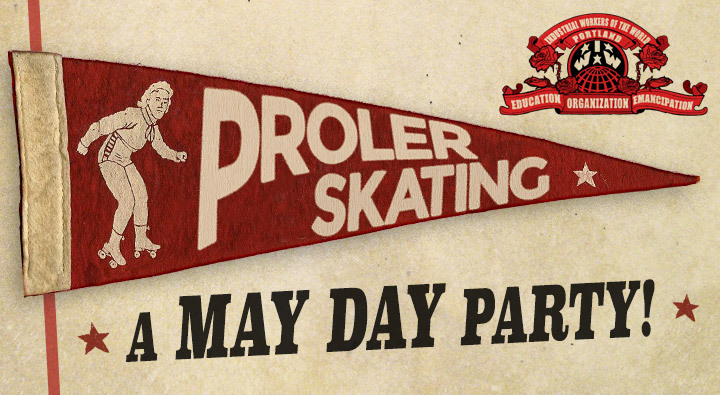 is proud to present our own awesome May Day party: PROLERSKATING! All workers are welcome to our FREE rollerskating party at the Mt. Scott Community Center’s roller rink on Friday, May 1! The action begins at 8:30pm, and we’ll roll the Union on until 11:00pm! Also, there will be an unofficial pre-party in the playground area outside of the roller rink, as we wait until 8:30 to go inside. Please share this event with your family, friends and co-workers! * note: alcohol is not permitted at the Mt. Scott Community Center. Let’s save the spirits for the after-party!